‘Source’ was a collection of new and old stories – both personal and mythical, ‘distillations’ on the theme of water through traditional storytelling and poetry (written by children from St. John’s CE Primary School, Wimborne in workshops with us), and songs composed by Peter Aston, and through soundscapes designed by sound artists, Adrian Newton, Rob Hart and Dan Horitz, who as children took part in early productions of Wimborne Community Theatre. 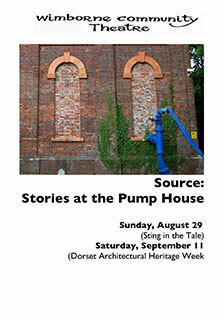 The two performances of ‘Source’ were performed as part of the Sting in the Tale Storytelling Festival and Dorset Architectural Heritage Week programmes. Source was a pilot production in preparation for the larger project undertaken during 2011. The following items from ‘Source’ at Wimborne’s Pump House, have been stored in our materials archive. Click here to view.